In Ruth Reichl’s latest book — one that will delight her fans and convert those as yet uninitiated to her charming tales — the author brings to life her adventures in pursuit of good meals and good company. Picking up where Tender at the Bone leaves off, Comfort Me with Apples recounts Reichl’s transformation from chef to food writer, a process that led her through restaurants from Bangkok to Paris to Los Angeles and brought lessons in life, love, and food. It is an apprenticeship by turns delightful and daunting, one told in the most winning and engaging of voices. Reichl’s anecdotes from a summer lunch with M.F.K. Fisher, a mad dash through the produce market with Wolfgang Puck, and a garlic feast with Alice Waters are priceless. She is unafraid — even eager — to poke holes in the pretensions of food critics, making each meal a hilarious and instructive occasion for novices and experts alike. 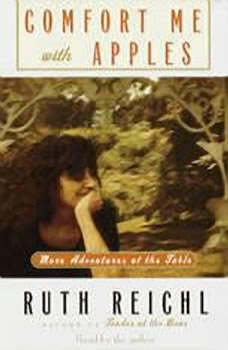 The New York Times has said, “While all good food critics are humorous .. few are so riotously, effortlessly entertaining as Ruth Reichl.” In Comfort Me with Apples, Reichl once again demonstrates her inimitable ability to combine food writing, humor, and memoir into an art form.